Franciacorta is Italy’s prestige sparkling wine. 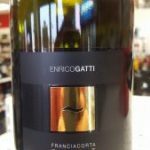 Produced only in northern Italy’s Brescia province, Franciacorta is made principally of Chardonnay or Pinot noir fermented in bottle using the traditional method of Champagne. This is in contrast to better known Prosecco, which is fermented in tanks using indigenous varieties. 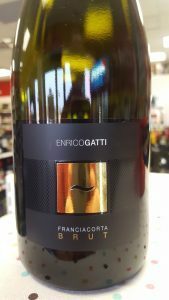 The Enrico Gatti Franciacorta Brut is very dry with bracing acidity. It is a blanc de blanc, meaning that it is made from 100% Chardonnay. Many people serve sparkling wines as aperitifs. But with it’s high acidity and palate-cleansing bubbles, this wine would be outstanding with crispy fried foods or rich white sauces. Try it with fried chicken (e.g., Northern Fried Chicken) or with spaghetti carbonara.